Some of you know me too well I’m thinking. A certain Neil Jarrold clearly knows what my favourite truck is as I was the only person he tagged in one of his latest photos on Facebook. Yes I love the little MAN TGL LX and none more so than this, almost brand new Italian version. What more could I want from a little Tonka toy like this? 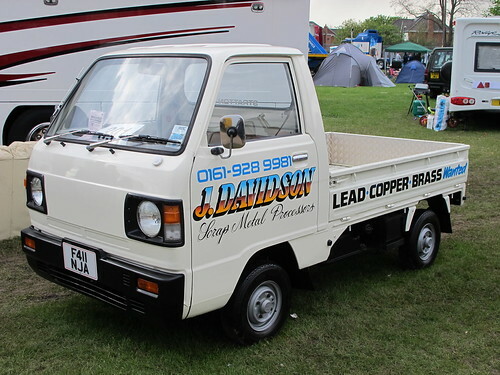 I mean its got colour coded bumpers and mirrors, ally wheels, long-range ally fuel tank, tidy little hanging garment box, plain, understated and just dam smart!! I love it. As for the photo, that was taken by the man who spends many an hour standing on a bridge at Junction 9 on the M20 in Kent, yes the one and only Mr Neil Jarrold. Neil is a truck perv of the highest order (no matter what he says! 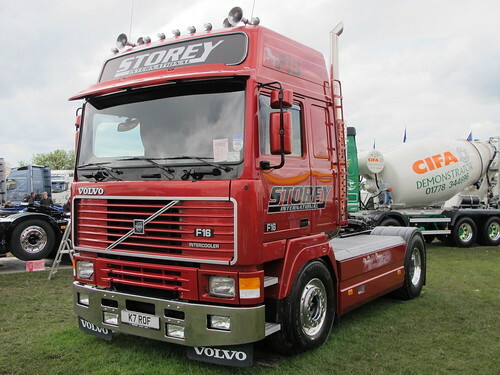 ), his career as a Volvo truck salesman means he knows a thing or two about most fleets in the country and was also responsible for the Volvo FH XL70 special edition. These days he runs a small used truck business, as well as continuing to take many a top class photo for us all to enjoy, such as the little MAN above. 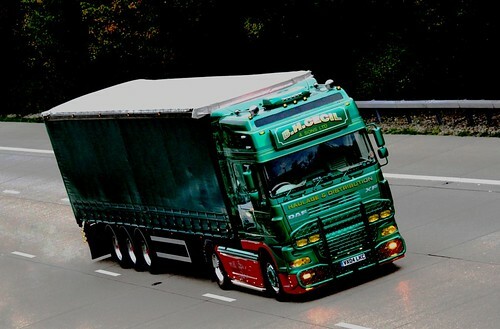 Neil’s photos are getting better and better, I mean you can’t get a better “on the move” photo of Paul Cecil’s delightful DAF than that. Really you can’t. The one problem with being a top class photographer is that there is always a few who want to abuse your talents. By this I mean those of you who right-click and save photos from the internet then either claim them as your own or put them ebay to sell for your own ill-gotten gains. If you want to use one of Neils or anyone else photos, then why not just give them a credit, after all, Neil takes his photos for us all to enjoy so why not repay the compliment by just adding to your use of the photo “Neil Jarrolds Photo” or “taken from www.euro-wheels.com” that way we all know where its come from, the photographer gets a mention for his great photo and you can’t be called a nob by all and sundry for nicking some one elses photograph. You all got it?? Good, now put the soap box away as I don’t need it. Although I will add that I actually saw one of my own photos on eBay for sale recently that I took at Assen this year. How do I know its mine?? because the muppet who was selling didn’t realise the 2 spots of the photo are scratches on my lens! Thanks for the great photo of the MAN Neil and please keep taking photos, so the majority of us can just sit back and enjoy them. 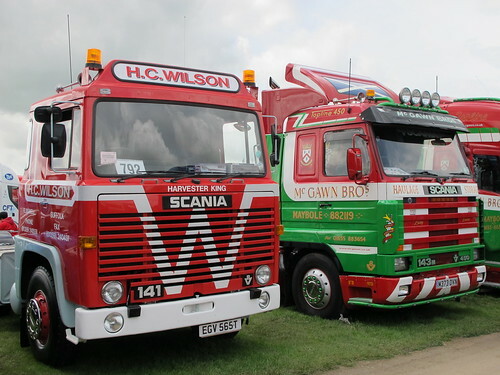 If you go to the Euro-wheels website you can trawl through loads of Albums of trucks back to the 1980’s and beyond. All three of these photos are copyright of Neil Jarrold 2013. Although I run this little website for like minded truck types, I honesty still feel self concious (if that’s the right wording) about taking photos of trucks…yes really. I’m not like the Neil Jarrolds or Ferdy De Martins of the world, who happily take photos willy and indeed nilly. For what ever reason i’m still not a confident wagon snapper. Anyway I thought it’d be a let down to my loyal readers if I didn’t take a few photos while sitting in Calais waiting for my boat. The dock wasn’t busy and I was only snapping out the truck window through a handy sized gap in the car transorter next to me, so the photos are not that great, they are a bit dark. 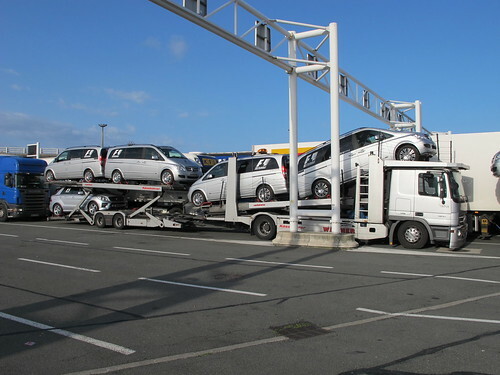 The wagon above arrived in Calais, followed closely by a slightly smaller version. 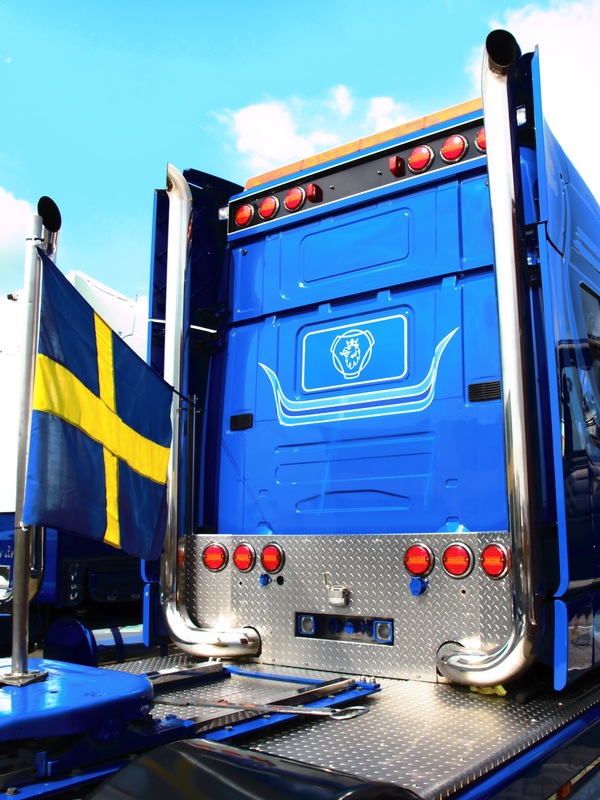 Both Scanias are Austrian registered and are used on the F1 Grand Prix circuit. They are used to build the hospitality units that we all see on the TV. I did have a tip off they are just for the Red Bull team, but i’m not sure how true it is, as it seems a little odd for a racing team based in Milton Keynes, UK to exclusively use a truck mounted crane company from Austria. Leave your comments please. 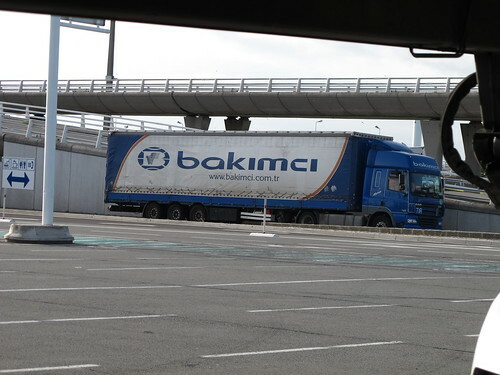 Speaking of F1, parked next to me was the above Mercedes Benz Actros car transporter (you can just the KFL logo behind). This one was parked behind two others and there was also one at the front of my lane. 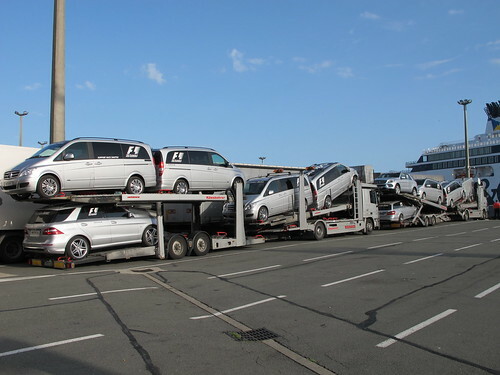 As you can see they are all loaded up with the F1 support vehicles. Each silver Mercedes Benz car or Vito was marked up with its purpose, such as; Media, Medical, Race Support (the 6.3 litre AMG estate! ), Extraction (??) etc etc. Very smart. 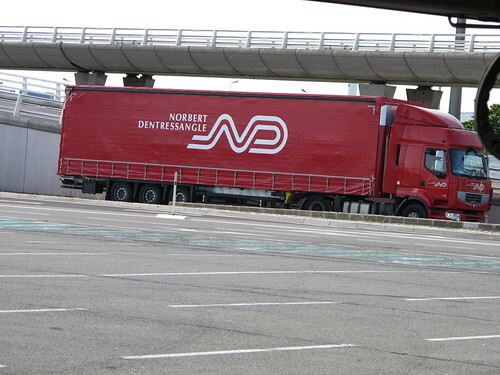 Being in Calais you’d expect to see a Norbert, but these days you don’t see French registered ones. 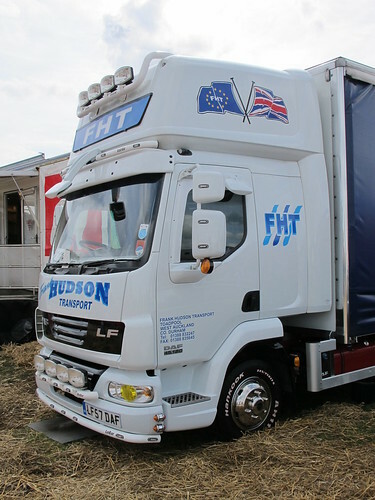 Just like everyone else ND now uses Eastern European registered trucks. Plenty of other Eastern Europeans about including this odd liveried Bulgarian Scania. Apparently it is supporting the Aston Villa captain who has Cancer or Leukaemia, but is a Bulgarian national hero (I don’t know much about soccer anymore), but Mr Lloydswell Dodsworth filled me in. Much to my delight there were also a host of little Tonka trucks of all nationalities coming and going. First a very old and over worked Red Atego. I think the number plate looked Hungarian, but what ever it was, it did look like it should be on it’s last return journey to its home land. 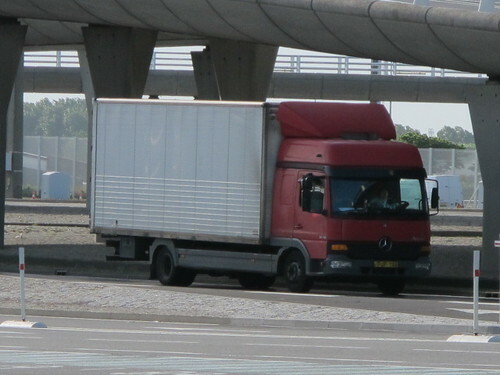 This little MAN drawbar was obviously not sure which boat, lane or line he was supposed to be shipping to the UK on as he was already in a lane when I arrived, but over the next 45 minutes, manged to change lines and line a further 3 times. I wonder if he ever got to the UK, or even if he wanted to get to the UK in the first place?! 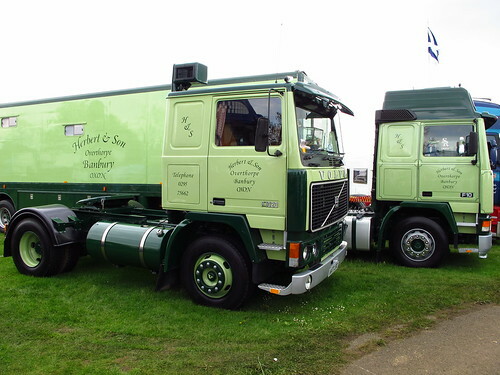 Remember 4 axles, means a GVW of 26,000 kg, according to my some what sketchy, previous research! 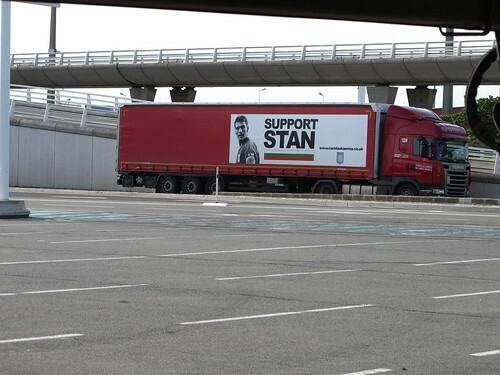 An English truck, heading off into France on a Friday morning. It would have to be some thing special and it was. A 7.5 ton Iveco Eurocargo Pigeon Carrier! 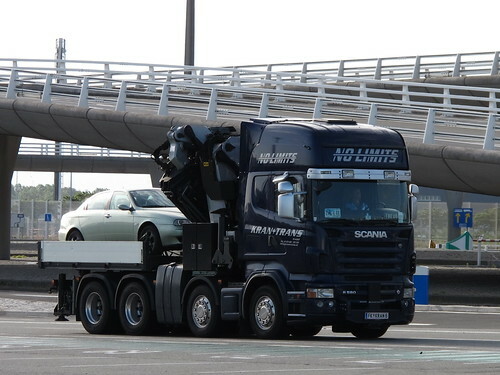 The truck was a 54 plate and had a sleeper pod on the roof, so it must go a fair distance. 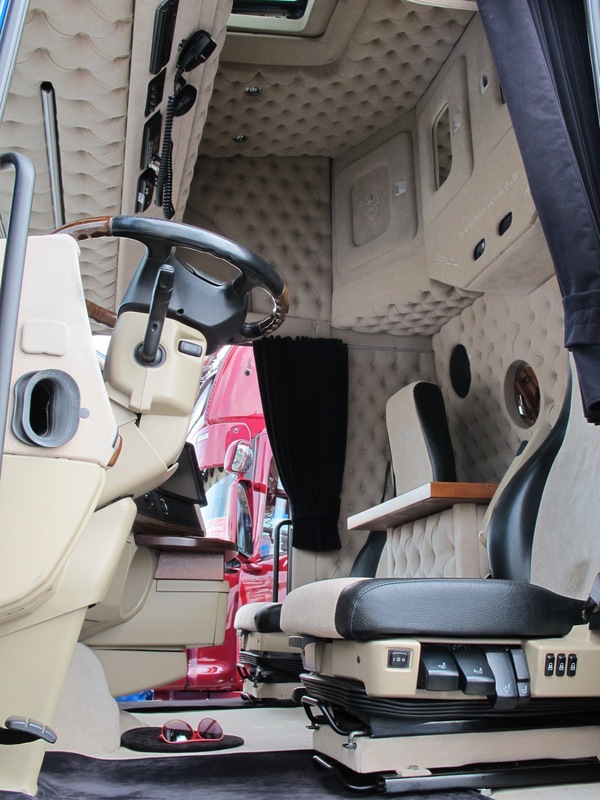 Although it would be quite cosy with the 2 drivers in the cab. 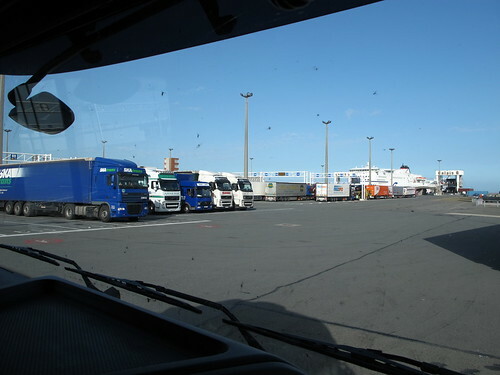 Driving on the boat, there were a few more Angleterre trucks heading home. Armoric Freight Volvo and another big cabbed Mercedes Atego, that I want to say was Dods & Brown, but i’m sure that’s wrong. Please correct me. I saved the best til last. 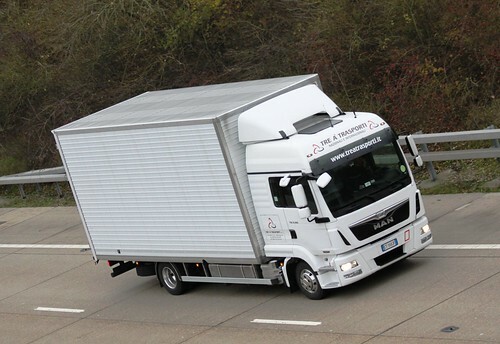 This could be my current perfect truck, apart from, as another well know MAN TGL driver agreed with me, they should have put those fake side panels either side of the fridge unit! 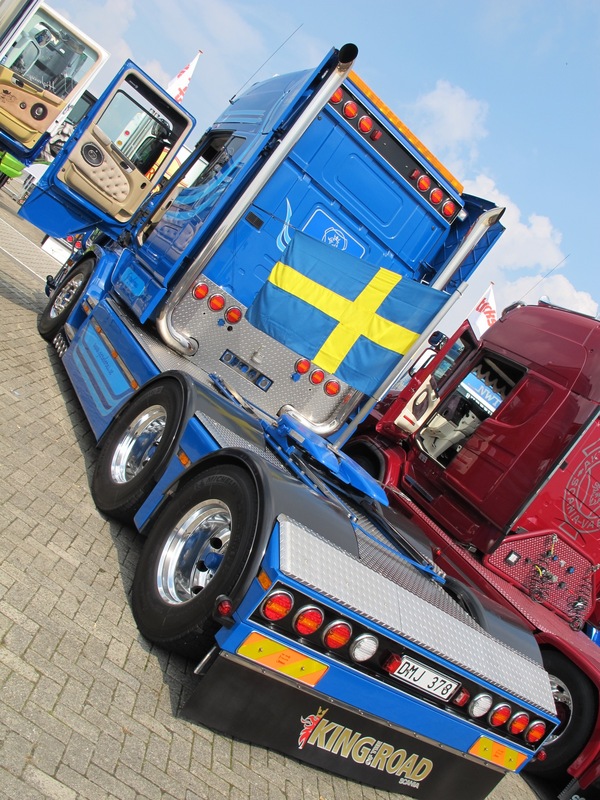 If I was offered this truck with Euro work or a big artic with Euro work, I would honestly choose this. 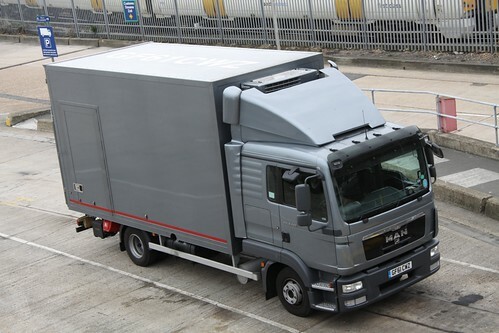 An MAN TGL LX, 12.250 with a Lamberet fridge body. Spare wheel, long range tanks and still with tyre shine on, this must be its maiden voyage to the UK and hopefully not its last. I think it needs a sun visor though. If I was Neil Jarrold, I would have walked off to find it and take some more pics and I wish I had. 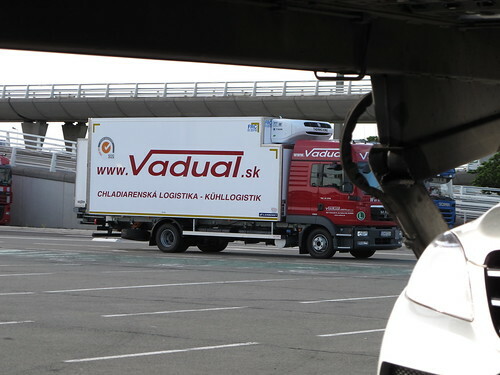 I think it was parked behind the Armoric Freight Volvo, unfortunately not on my boat. For any one rich out there who wants an investment, buy me one of these in blue and I will make your money back two fold! There it goes…..Proof I was taking my pics through the body of that F1 transporter above. 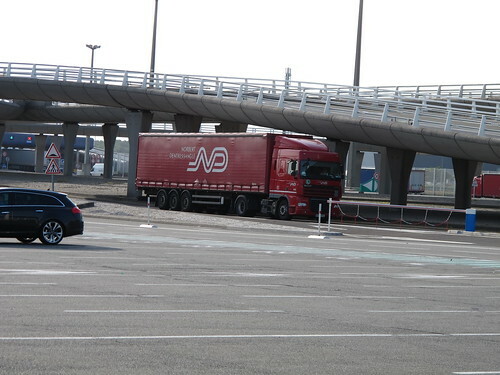 I do wish I had the time to spend a Friday or Monday sitting in Calais proper spotting……One day. Where to start?? Well it started as a shambles really. I, in my wisdom decided to go round Peterborough so I could enter from the North side, as I have spent the last 15 years arriving from the South. My advice? stick to what you know. The main car park fields were waterlogged so we were all being stuffed into every available gap. Then we were all directed to the gate directly across the swamp like car park. Having waded across with a number families and countless others loosing wellies and shoes to the mud, we got within 100 yards of the gate only to be told we had to walk back round to the other gate passed where we had just come from. Approx 100 others did this exercise round to Gate 5 but then no one else joined the queue….I think we were had. We then queued on the main road into the Showground for 40 minutes then we were finally allowed to enter. Of course for this privilege of no one knowing what was going on I was charged £17 entry, what do you get for your £17 entry? a free cuppa? a free programme?? A voucher for a burger??? Nothing. I think it’s high time that Live Promotions re thought their pricing. £17 is more expensive than my local world class Zoo! Enough moaning, its the same every year. 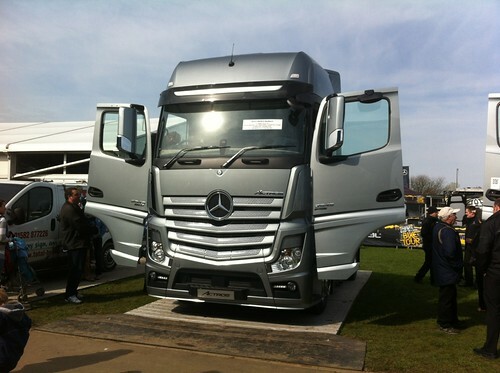 Next up and one of my main targets was the New Mercedes Actros. I was not alone, by 0915hrs all doors on the available Mercs were open and rapidly filling with people and potential buyers, young and old! I lined up and got myself in the Gigaspace. Gorgeous. For those of you who are sceptical of the new Big German having seen it in the press then let me assure you that in the flesh you’ll be impressed. Now that Mercedes are trying to use more car components in the trucks, the interior is looking very plush and is very similar to the car range. I learnt this thanks to the very helpful Nigel in the cab; The Bigspace cab is the same space as the current Megaspace but the Gigaspace is bigger still than both the Current Mega and the new Big. Crikey i’m all spaced out!! On the outside the big grill is very imposing but very smart. 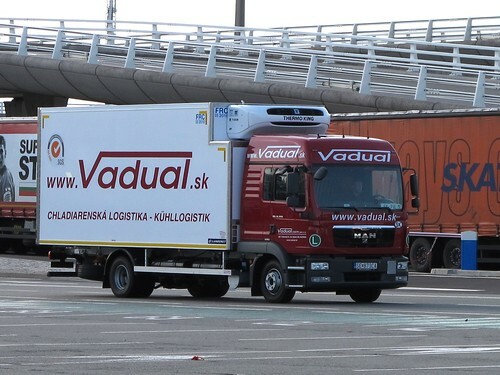 I really look forward to seeing the smarter fleets getting these trucks in their liveries. Firms like Pulleyn, Stobart (we’ve seen these already) and the likes of the Formula 1 Teams I think these smart Mercs will excel in promoting the image of who ever they are pulling for. 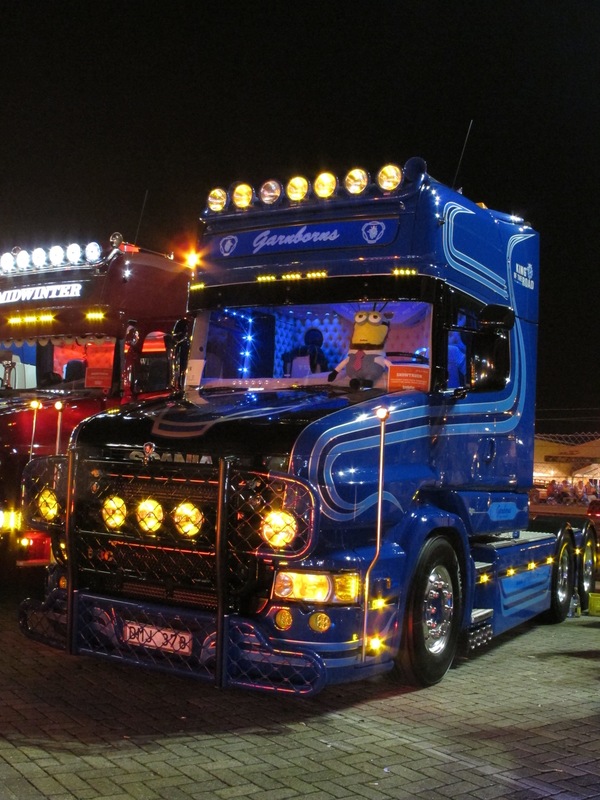 As for the rest of the trucks on show it was very difficult to decide what was best. 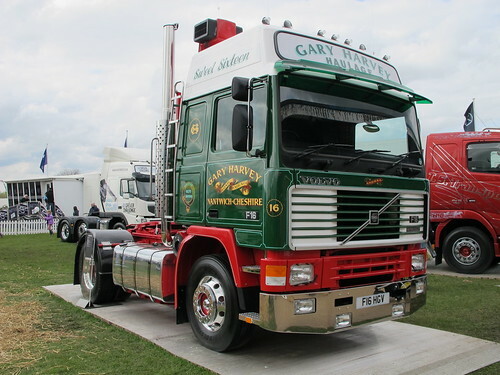 As well as a few new trucks and some old favourites, some of the best trucks on show were the increasing numbers of retro trucks. 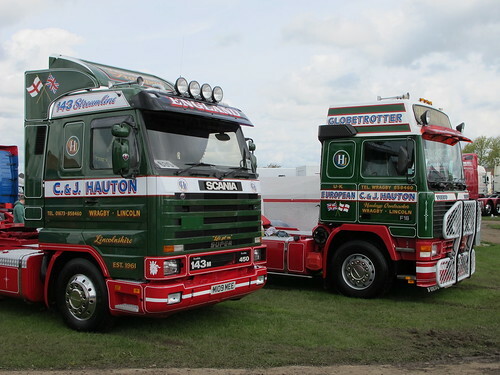 I know we now have Retro Truck Shows, but the quality of these old girls is pretty amazing and nice to see. 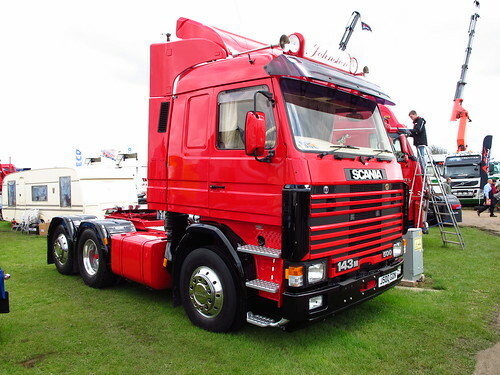 A number of F12 and F16 Volvo’s, some glorious Scania’s, 142’s, 143’s and of course a couple of 141’s. 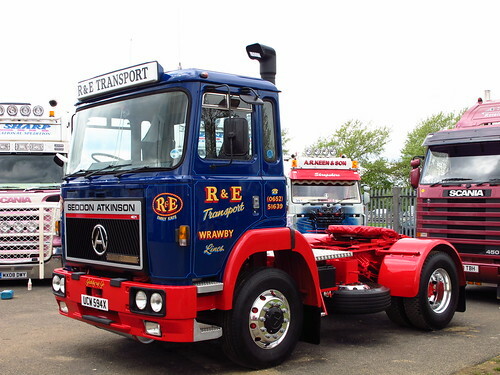 As well as a very British and very very tidy Seddon Atkinson that was getting lots of attention. Well done who ever owns it. The usual displays occupied the arena. 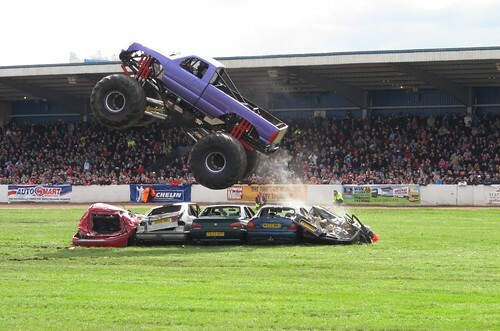 Arrivals of soap stars, motorbike displays and of course the ever impressive monster trucks. Good fun although no roll overs this year (a little disappointed!). Along with all the big boys, there were also a handful of my favourites, some little Tonka Toys. 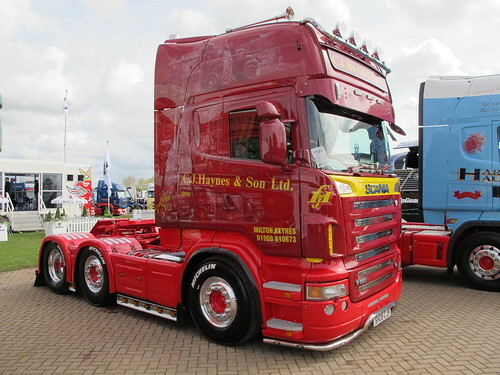 I found Lewis Blakeys stunning DAF LF from Frank Hudsons fleet. Also I came across 2 other Hatcher cabbed DAF LF’s. 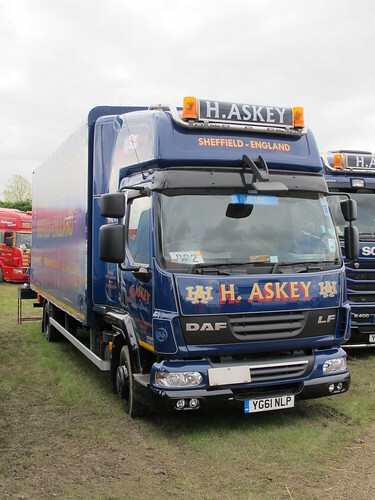 One from H. Askeys fleet from Sheffield and one from AAA Couriers of Bradford. This driver was looking forward to a trip to the Champions league final in his smart little DAF. There were obvioulsy many others around the Showground. 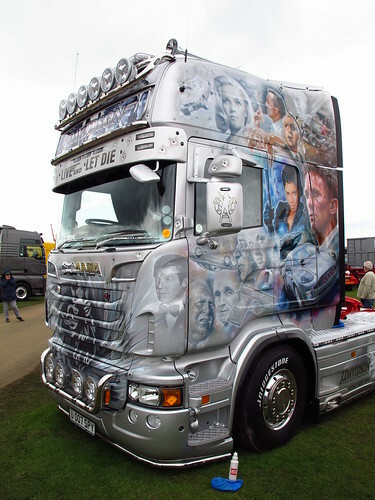 A few more stunning big Scania’s, including the James Bond 007 themed R730 that belongs to scrap metal firm J Davidson. Loving the bullet holes and surely the best number plate at the show! Davidson’s R730 traing vehicle was also very clean and attracted plenty of photographers!! 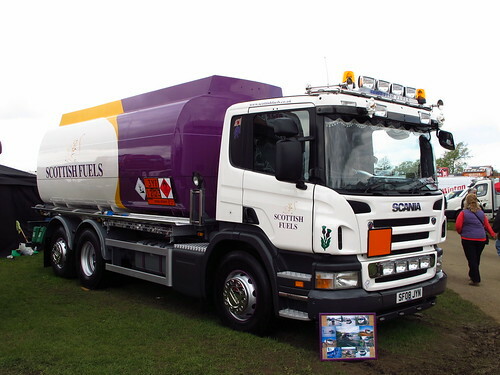 Possibly the smartest tanker you’ll ever see. The driver must have forearms like Popeye, with all the polishing they must have done to get a ladder to look that shiny!! A real credit to the driver and the company and all on an 08 plate. Other than that it was an ok show. I did miss the lovely Lisa Kelly from Ice Road Truckers. The weather stayed nice on Sunday which made a change. The only thing missing or so I though was the customised fleet of Coles & Sons of Banbury. 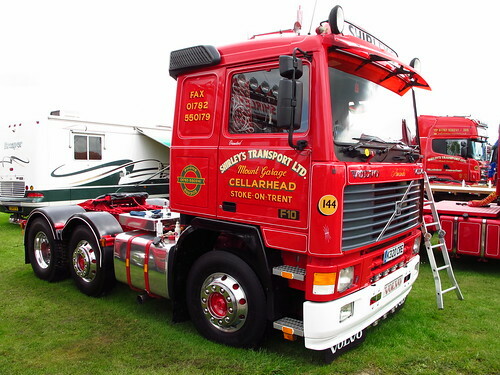 Unusual not to have any trucks at the show. Well I was wrong. The one truck I missed was this stunning new addition to the Coles fleet. 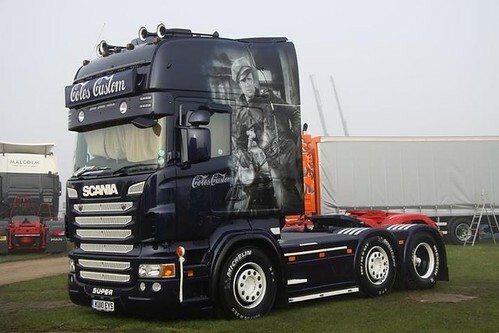 Matching the coolness of the figure painted on the side, Marlon Brando, this Scania oozed class. I’ve long been a fan of painting trucks and parts rather than shiny shiny. So it was a pleasure not to see a piece of stainless steel in sight. I absolutely love it. Coles Custom is as cool as it gets in my book and I was told it’s not even a V8! Brilliant, well done Coles I hoped you got your reward. 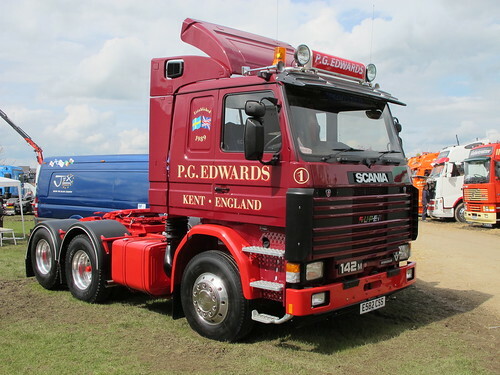 This photo belongs to the worlds photo library of trucks that you’ll find on www.euro-wheels.com , the one and only Neil Jarrold doesn’t miss a thing so I have to thank him very much for letting me use his photo of the Super Swede from Oxfordshire. 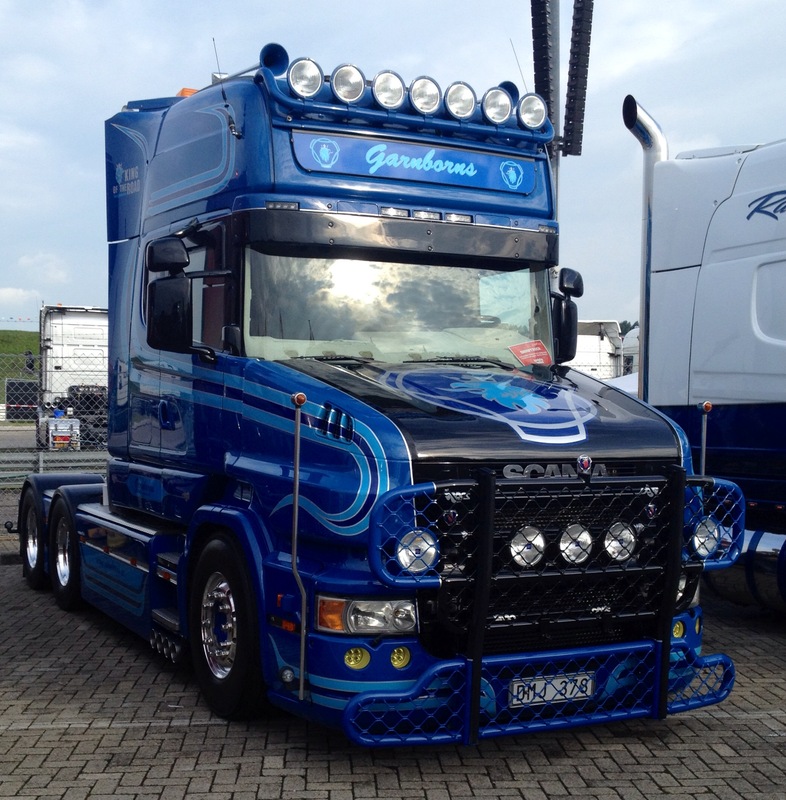 There will be more of my finds at Truckfest on the blog in the near future. For now if you want to see a few more of my photos then click HERE. 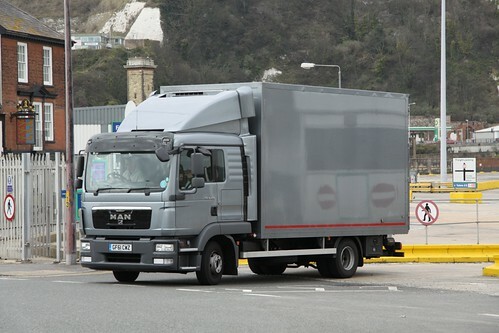 Truckblog’s good friend and contributor, Neil Jarrold from www.euro-wheels.com spotted this gorgeous little MAN TGL in Dover few weeks back. I’d love to know who’s it is as it looks like a high spec little tonka toy. I have a sneaky feeling that it’s a firm from London, but I hope you lot can tell me for sure who’s the owner. 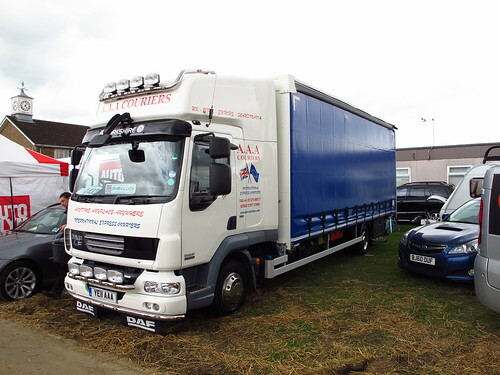 Top spec including; slam locks on the cab doors, fridge / chiller body, full height tail lift (perfectly smooth for a truckblog sticker! ), fire extinguishers, side door in the body, sleeper cab, vehicle reg on the roof, air kit, looks like it has been well thought out and I dare say a regular visitor to the continent. One blogger says he saw a bigger MAN in the same colours, but I still can’t remember the name of the firm!! 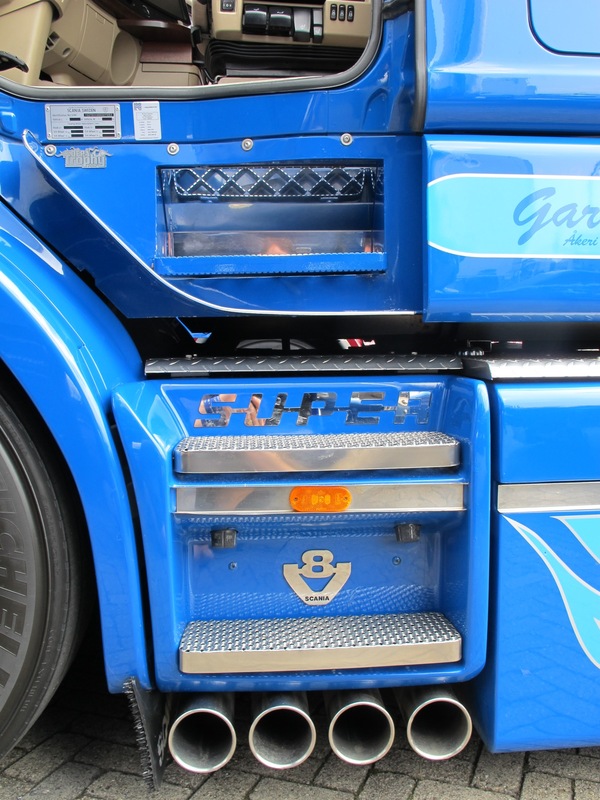 If you can give me any info on this Mystery MAN, then please leave a comment or email me; ben@truckblog.co.uk and hopefully we’ll work out who’s it is. 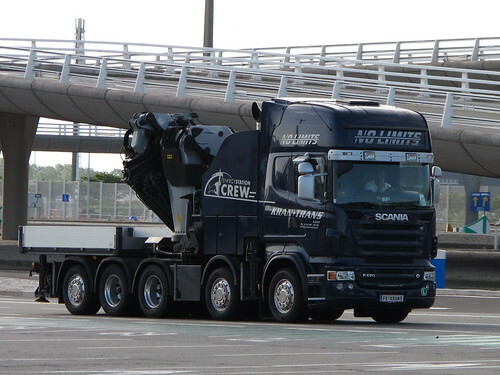 Have you seen a regular under 12 ton truck in and out of Dover or to and from the continent then please tell me about those too. 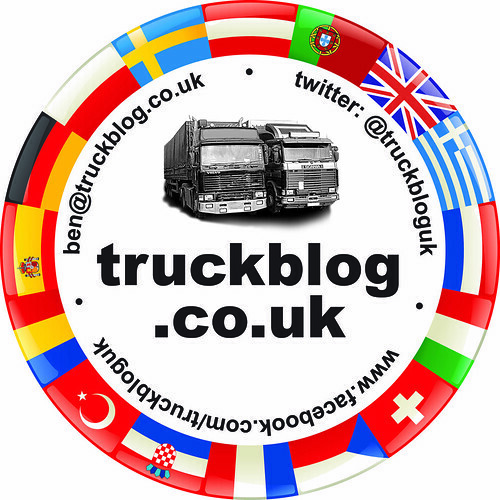 Thanks again to Neil Jarrold for providing more blog content, don’t forget to visit his website www.euro-wheels.com you’ll be there for hours! 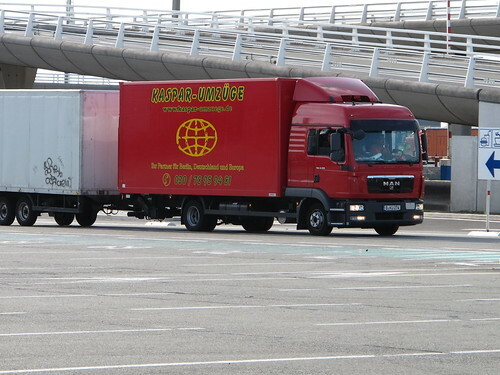 Where in the World is This ACH Truck Parked?? 1) Where was it taken? 3) What is the significanace of the double white stripes on Italian bumpers? 4) What happened to ACH Volvo WJO 677R? 5) Have you got any ACH photos you want to share? 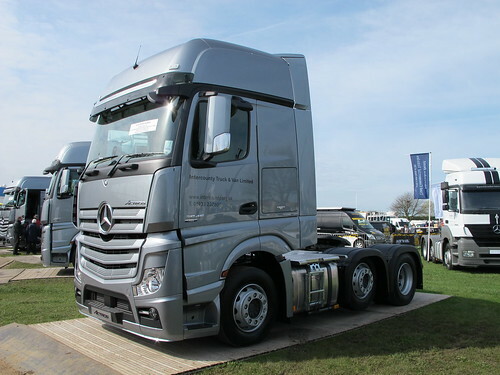 If you have any answers to these questions please leave a comment or email me; ben@truckblog.co.uk I have a thing for ACH so any photos will be well recieved.